Until the 1920s the rods were stripped by the women and children, one rod at a time, using a brake. In the 1920s the drum stripping machine was developed with 108 small brakes on it. The first drums were made of wood but were subsequently made of steel. The drums were designed so that two people could work side by side. Two manufacturers made the castings; Hawkes of Taunton and Storey Engineers of Boroughbridge. The machines were powered by electricity or diesel. This type of machine was in use at Coates until 8 years ago. The drum that we saw in use was made by Storey and it was in a Hawkes machine. The Hawkes drums were a flat plate and the Storey ones were ribbed. The Storey drums were cast iron - hence ribbed. They crack occasionally but do not fall apart. 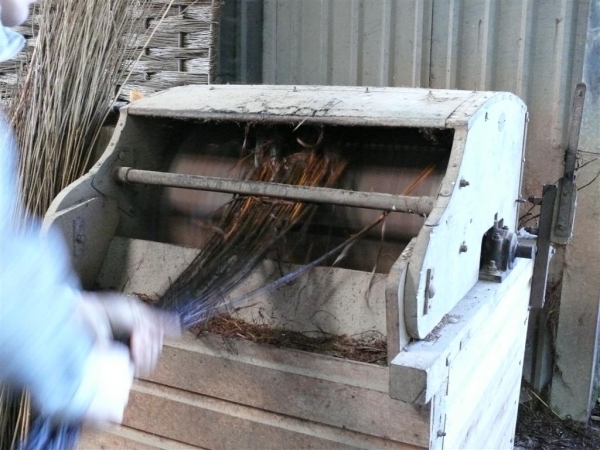 About 10 years ago Coates bought a huge machine which can process a great deal more willow at once. The machine can be adjusted according to the size of willow to be stripped and can handle rods of lengths from 4 foot up to 10 foot. Runs on a 2 to 3hp single phase electric motor alternatively a Honda 2.5hp engine or a Briggs and Stratton motor would be fine, or a small generator for an electric motor. The shaft is integral in the drum. Pulleys & v - belts. The brakes are made of sprung steel; the drums were refurbished regularly when in regular use. Because the drums are designed so that two people can work side by side, the drum will be fine even if there is only half the number of brakes on each row. The upper round bar (the one the willow goes underneath before coming into contact with the brakes) should not be too near the drum; if it is tighter it is harder on the willow. It is far less likely to damage the willow if the bar is further back away from the drum. The hardwood bars across the drum are there to take the wear off the willow which would otherwise be rubbing against the metal drum. Stripped willow is stacked upright against a strand of barbed wire or fence outside until it is dry. Once the willow is dry it is moved into the building. 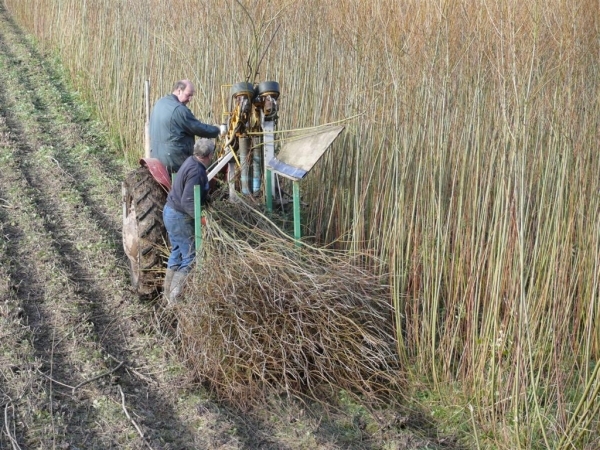 Willow cutting continues throughout the winter. What they cannot deal with at once is stored. They bundle it and lay it flat over two railway sleepers to keep it off the ground and build it up into a pyramid with all the tips facing the same way so that the bundles are sloped to enable the rain to run off. The bundles can stay outside stored like this all summer as well; the only damage would be possibly a bit of sun scorch (shown by an orange colour) to the outer rods, which means they will not strip well. So long as the rain can be shed there are no problems with rot and the willow does not come to any harm from being outside if stored in this way at any time of year. A sharp billhook (Jonathan Coates name for it but we would call it a sickle) is the best tool for cutting willow by hand. It should have the end of the curve cut off as that part is not used. Chainsaws and strimmers are not efficient for willow cutting as the rods scatter in all directions and have to be gathered and stacked neatly. Secateurs are slow as each rod is cut individually as well as having to gather up the individual rods, which makes the job even slower. The old tools are the best rather than buying new because the steel is better in them. Morris, Fussell, or Bradley are the best makes. Look in car boot sales or other second hand sources. The Fussells ones should not have the name stamped on the blade as the stamped ones were manufactured more recently. They boil the willow for 9 hours before stripping it. Jonathan Coates recommends coal for small scale boiling (or wood we later saw that Musgroves use wood for their boiler) because it keeps burning for a few hours without constant supervision and he says that gas is all or nothing. The boil needs to be controlled; they use oil and control it with a thermostat but the control gear is very expensive. For a solid-fuel fired boiler the tank goes on a bridge area with a flue at one end and the fire would be below the tank. (We learned later that Musgroves boiler is wood-fired). A flange is needed in the tank to keep the willow under the water. Cross bars can be wedged under this to keep the willow under the water. The tank they use has a large metal basket for lowering the willow bundles into the water and removing them after boiling. To boil brown willow put it into cold water and bring it to the boil it does not strip so well if it goes straight into boiling water. Jonathan recommended that our tank should be big enough to take eight bolts at once, this would be 2 feet x 2 feet x 8 feet with a flange on the top along each side. Bars can be wedged according to the number of bundles of willow in the tank. It is better to have a good size tank rather than one that turns out to be too small because you think initially that you will not need one any bigger. We noted that one basketmaker sat on a chair instead of a low plank and had a lapboard in front of her with legs to bring it to the right height for the chair she was sitting on (more or less the same height as the chair seat). The workers sat on raised wooden platforms with underfloor heating! The floor itself was concrete which keeps the willow cool until it is used. The man who makes the coffins can complete one in a day. The workers are on piece work and work very long hours. P H Coate and Son have just completed an order for Waitrose for several pallet-loads of bread display baskets! These are planted at intervals of one foot in rows two feet apart. It stays productive for up to 25 years (on the website it says 30 years). In the early spring cattle are grazed on the willow beds to prevent the stools from producing shoots too early and then being damaged by late frosts. From mid-May to mid-August the willow has to be weeded and sprayed constantly. (The willow beds that we saw later were however full of weeds so maybe this has changed since the video was made?). 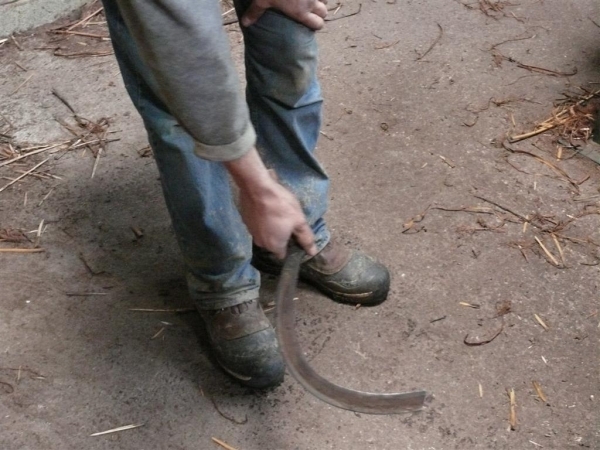 Harvesting begins in mid-November using a very sharp hook. Bundles are tied with a rod of willow and secured with the traditional rose knot. In former times the willow fields were often flooded and the transporting of the cut willow away from the willow beds to the farm or the basketmakers had to be carried out by boat using a flat bottomed rowing boat called a withy boat. 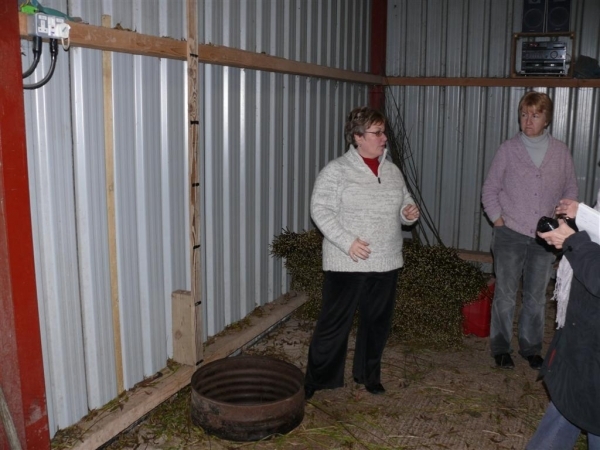 The cut willow was sorted using a barrel sunk into the floor with a measure marked out in feet alongside it. A wad is a half-bundle of willow. The rods were boiled for 9 hours continuously to release tannins and other chemicals which gives the buff willow its colour. The boiling also softened the bark to make it easy to strip. Two-year old rods were stripped by hand to use for basket base sticks and for furniture. When dry they went to the tying house where the bundles were clamped tightly and tied with a rose knot. 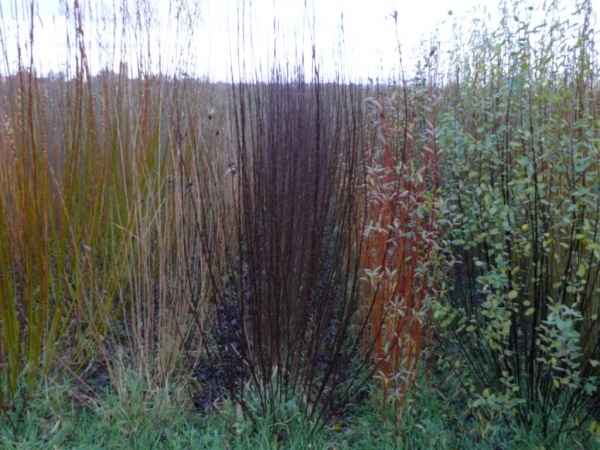 White willow is produced by standing freshly cut rods in 6 inches of water to keep them alive and leaving them all winter. Once they come into leaf again around the end of May the bark is stripped, often by hand. White willow is used for laundry baskets, bakers baskets, and cradles. Brown Willow is green willow which has been allowed to dry. It has to be soaked or steamed before use but is used with the bark left on. Steamed willow is brown willow which is steamed for two hours then used with the bark left on. 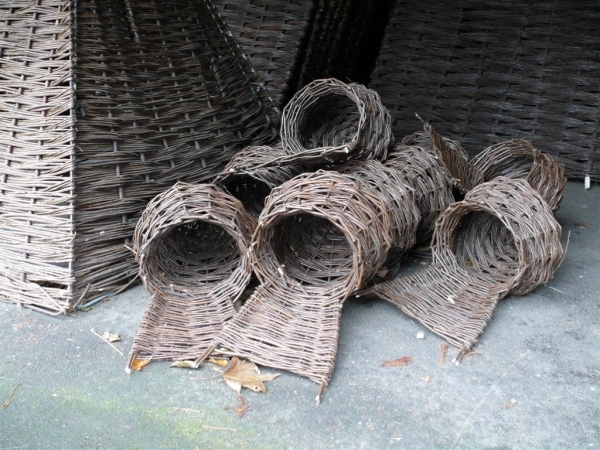 Basketmaking; the willow must be soaked then mellowed. The maker sits on a plank with the basket on a lapboard in front of him/her. Tools are a knife, secateurs, a bodkin and a rapping iron. Handles are made from two-year rods. Four thinner rods are then wound round the handle and tied over and through and finished on the inside. In former times baskets were used widely as containers in many branches of industry and manufacturing as well as in a domestic setting e.g. skips for use in the wool and cotton mills, agriculture, produce-gathering, post office sorting offices. In the 19th century there were 9,000 acres of land used for willow cultivation; at the time of making the video there were 250 acres. The video showed a basketmaker working on a square basket base. He held it between his knees to put the side stakes in which he did by bending them and hammering them in. 3. Coates are currently planning to produce an updated video/DVD. 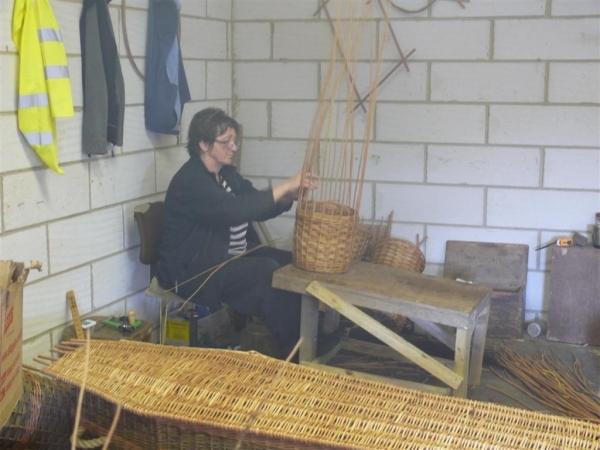 The giant basket we saw in the barn was used by P H Coate & Son as a portable counter at the Somerset willow fair! Musgroves have 80 acres of willow beds and are planting more. They are principally growers although they do make and sell some baskets too. They also run courses in basketry, lanterns, hurdle-making and garden structures, and have a large classroom in a barn converted for this purpose. They also have a freelance hurdles expert who works closely with them and makes the hurdles they sell. 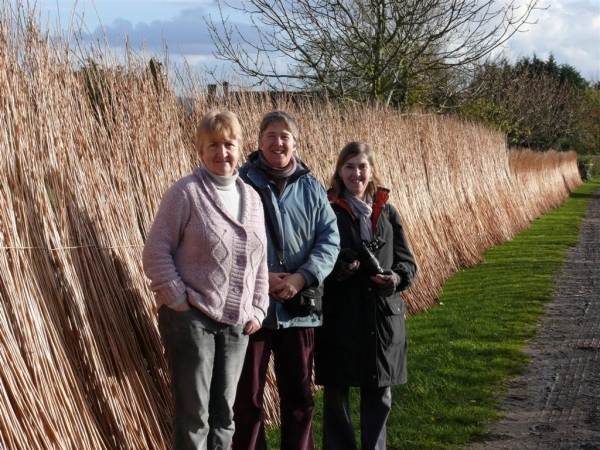 In the 1960s there were 3,000 acres of willow beds on the Somerset Levels but this is now down to 300 acres. 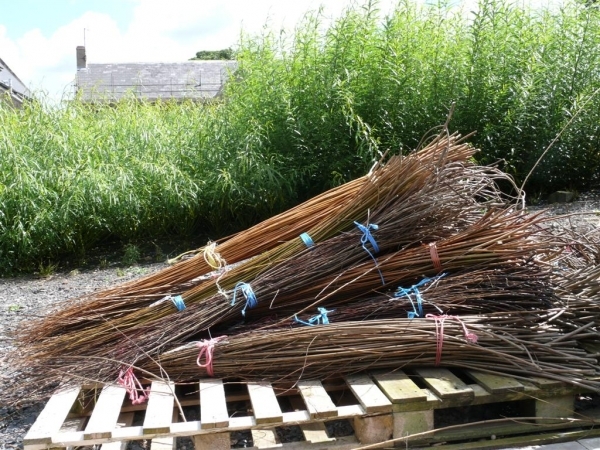 2-3 year willow is used for uprights and chair legs. Michael showed us one of the willow beds and talked about the varieties grown. 60 varieties are grown. Some of these are sold as coloured rods; others are grown purely in order to keep the varieties alive as they would otherwise die out. Pictures of most of these varieties and a number of others that they grow can be seen on Musgroves website. 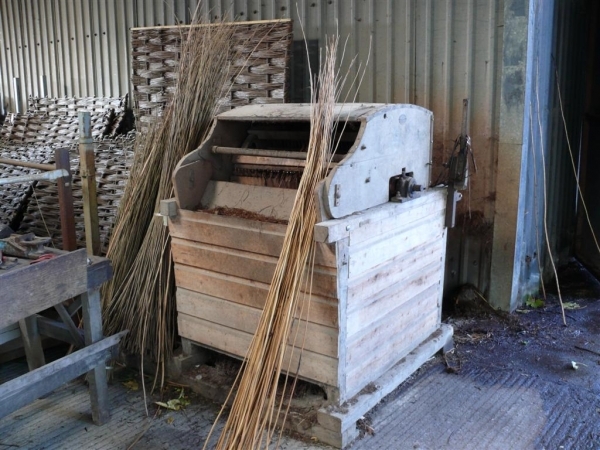 According to the pictures on Musgroves website they still use the 1920s-style stripping machine. The boiler they use is wood-fired. It is 14 x 4 x 4 feet and it takes 250 wads at one time. The willow is sorted in barrels sunk into the ground as at Coates. They seem to use every spare area of ground around the farm for drying buff willow, including having wires stretched along the bankside parallel to the road! Mandy demonstrated how to make a wreath. She pulled the ends through from the tips in a big loop. She recommended using 8 or 9 rods to make the wreath thick and chunky. This would make a good solid base with space to add other materials for use at Christmas. Mandy told us that if you make a wreath with all of the rods running in the same direction it will give a smooth finish. If the rods are in both directions it will be bulky.